It’s the Finale and the ultimate test of the models star qualities at a haute couture shoot with one of the world’s leading fashion photographers, and a runway show under the gaze of hundreds of celebrities and fashion industry elite. Walk your own red carpet with our exclusive edit of effortlessly-elegant maxi dresses and show-stopping evening dresses. Asia's Next Top Model is a reality television show featuring girls coming together from different parts of South Asia and the Far East region and giving them a chance to compete and be named “Asia’s Next Top Model” and to start off their career in the modelling industry. Back with a third season with a new host and judge, supermodel Georgina Wilson and fashion designer Alex Perry will be joining the team to help mould the aspiring models and help put them on the map and further their modelling career. If you have been watching and are wondering where all those Asia’s Next Top Model 3 outfits are from, they are from us here at ZALORA. For the third cycle of the popular reality television show, ZALORA is collaborating with the show and are the main clothing sponsor aiding in all the contestants challenges and getting them ready looking gorgeous and photo shoot ready. So if something had caught your eye while watching the show and would like to get the outfits like those worn by the Asia’s Next Top Model 3 contestants, why not visit ZALORA’s website and you might just find what you are looking for. Get the Asia’s Next Top Model looks online from ZALORA and you too could look like a supermodel straight out of the runway. 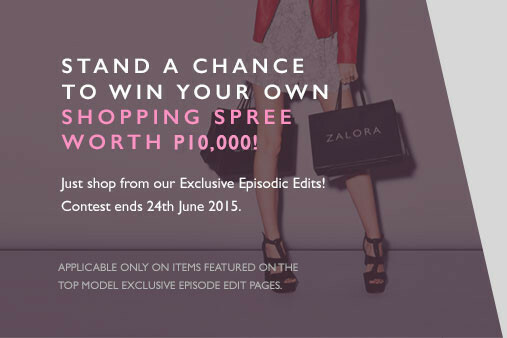 At ZALORA, shopping online will be less of a hassle and fuss free, enhancing your experience. What are you waiting for? Get that supermodel look from us today!